The Candidate Profile gives the details driving the Fitzii Score. It is divided into four main sections, each shown and described below. The first section summarizes the candidate's background information. It includes work history, qualifications and Impact Statement, if provided. The buttons on the right of this section allow you to access more details such as the candidate's resume, contact information and any documents or social media profiles they have shared. The green buttons allow you to access an interview guide, print the candidate details, and add & review comments. The second section of the Candidate Profile is the CAN section. This describes the candidate's skills and experience as they relate to the requirements of the role. Each skill /experience requirement is listed along with the length of time the applicant has possessed that skill/experience, the candidate's self-assessed proficiency level and any supporting explanation (required if the candidate has self-assessed at the Very Good or Excellent level). If the candidate does not meet the minimum duration specified in your requirements a warning indicator is displayed to the left of the skill. Whether or not the candidate meets the education requirements for the role is also displayed in the CAN section. The WILL and THRIVE sections are shown below the CAN section. The WILL section on the left displays the results of the psychometric assessment. The candidate's results are rolled up into the overall Fitzii score, with detailed results for the most important traits shown in the panel. A description of each trait is available by rolling over the name. For each trait the ideal range for the role is displayed as a grey bar and the candidate's score represented by a dark grey vertical line. The line will be red if the score falls out of the ideal range. 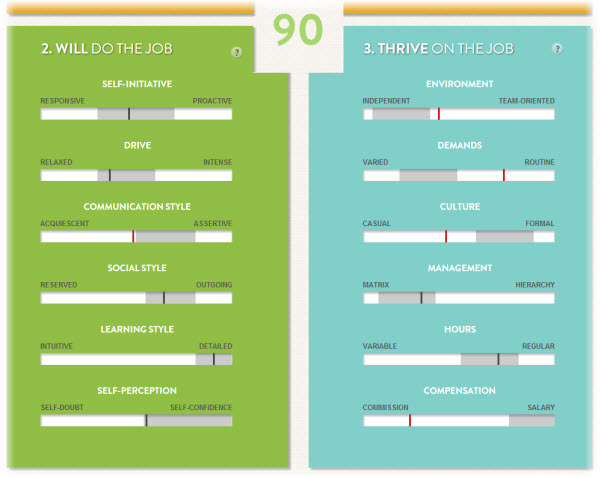 The THRIVE panel on the right displays the six scales used to describe how the applicant's ideal working environment compares to the one created for the role. What is of particular importance here is areas where there is a large mismatch between desired and actual (i.e. small differences are less important). The ? to the right of the Fitzii Score in the centre of the Candidate Profile provides some useful context for the score. Rolling over it will display the current range of all scores for applicants to the position, as well as the current rank of this particular applicant. When you have finished reviewing an applicant, you can either return to the list of shared candidates or navigate to the next/previous applicant by using the navigation options at the top right. At the top of the page you can also review the job ad that the applicant responded to. If you've completed the assessment, you should have received an email with instructions for accessing your profile and viewing your feedback report. This doesn't include your score for a specific position, that is only visible to the recruiter hiring for the position. It does include general feedback on your personality assessment though. how will i invite for assessment? How do I view candidates that have been shared with me?